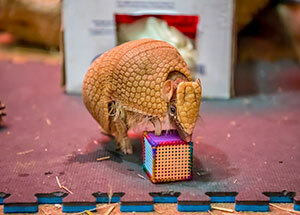 The Milwaukee County Zoo welcomes a resilient female southern three-banded armadillo to the Small Mammal Building. Mira was born on January 8, 2018, weighing just 76 grams, to mother Mona. Today, Mira is eight months old and weighs 1020 grams, which is around the same size as mom! Her life has been an uphill battle since birth, but she never gave up the fight! Immediately after giving birth, Mona showed signs of neglecting Mira. Since Mira was also not nursing, it was necessary to remove the pup. Her keepers were given the ambitious task of finding the right diet for Mira. Since Mira would not nurse or suckle, her keepers had to tube feed her. 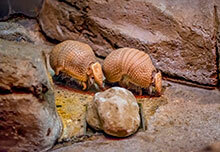 Other zoos were unsuccessful with hand raising armadillos due to diet issues, which led to metabolic bone disease. Metabolic bone disease is a bone disease caused by abnormalities of minerals (such as calcium), vitamin D, bone mass or structure, which can be corrected through changes to the diet. 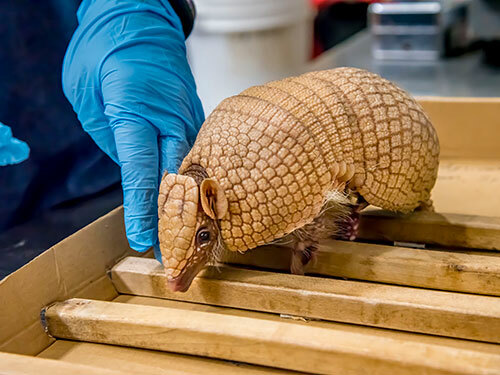 Mira’s keepers and the Zoo’s veterinarian staff consulted frequently with a nutritionist about how to replicate the milk from an armadillo mom. As she grew the milk would need to change to add more calcium. Through trial-and-error they worked to find the right combination of calcium, vitamins and minerals. Unfortunately, at six-months-old Mira developed metabolic bone disease. Her keepers continued working to find the right combination adding more calcium, vitamins or minerals. They needed to find the calcium that was most absorbable for Mira. Due to her weakened muscles and bones, caused by the metabolic bone disease, Mira took part in water and physical therapy to gain back strength. Today, Mira has regained strength, is back with mom full-time and eats a healthy diet of insectivore kibble, wet Purina cat food, yogurt, calcium, waxworms and crickets three times a day! Her keepers plan on introducing earthworms, which she will have to dig for in dirt, allowing her to get more calcium similar to in the wild. As her diet is changed, the hope is that overtime her metabolic bone disease will be reversed. 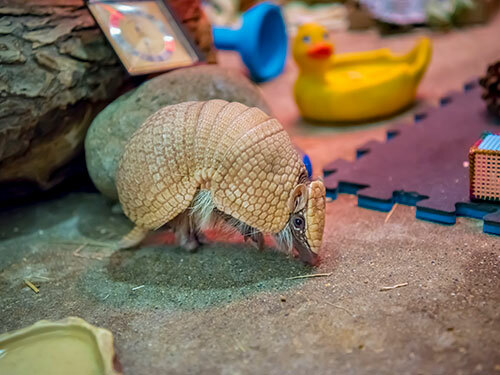 The name armadillo is a Spanish word that means “little armored one,” because of their tiny stature and armored shell. 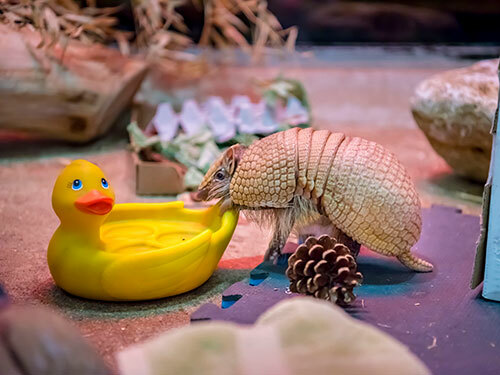 Three-banded armadillos are the only species of armadillo able to fully enclose themselves! 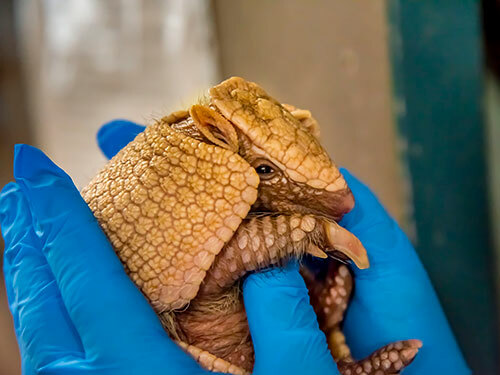 Armadillo offspring, referred to as pups, have soft shells similar to human fingernails. 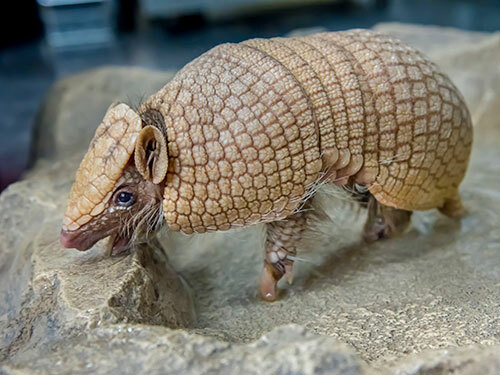 As they grow, bone deposits under the skin and the armadillo’s shell hardens. Thanks to Mira’s diet change, her bones have strengthened and her shell has completely hardened. Mira is nothing short of a miracle. Visit the Small Mammal Building and try to spot Mira and her mom, Mona. Hint, mom has a big green dot on her back, which helps keepers tell the two apart! Maybe you’ll catch them scurrying around or hiding in one of their many boxes!